None. Random Cotton Candy drops from Nami. Lv. 2 chains awaiting you. Be prepared for it using specials or sockets to remove those. GP Usopp very recommened to use in the boss stage. You need orb manipulators that can switch [QCK] to [STR]. Use STR characters, most enemies are DEX. Nami bossstage can heal herselves completely up. 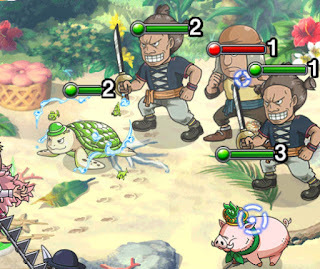 Those 30.000 damage you need to deal will work only for 1 day and will add the 2nd day and 3rd day accumulatively until the events ends. If you follow the Monster Chopper crew you will deal 32 or 33 Score every day. So you need only 3 days to get all rewards. Just go all in without stalling and get PERFECTs. Nothing will stop you from getting a score of 32 or more. If you want more use low cooldown DEF or delayers, but it's not recommened. Actually you can stall on the Cannoneer here. 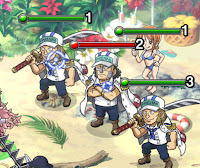 Nami pre-emptively chains the middle right character. 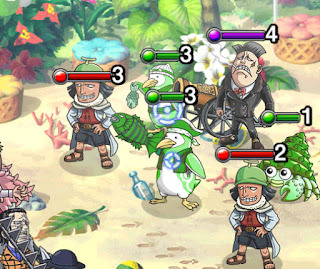 Either you have GP Usopp or Lv 3 chain socket here. Focus pistol girls, then stall effectively on turtles. Ok there may be only one real Nami. But the rest has the same ATK and HP and different abilities. 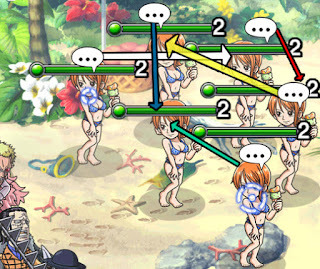 One of the Namis will say something and the arrows will lead to the real Nami which will despair both Cpt. and Friend on turn 4 for 2 turns. If Nami speaks in the back row. The full healing Nami will be in the front row. If Nami speaks in the front row. Full healing Nami will be in the back row. Removes all of your buffs. Chain Captain + Friend for 2 turns. Turns all orbs into [QCK]. Attacks every turn from now on. Damage reduction to 0 for 1 turn. 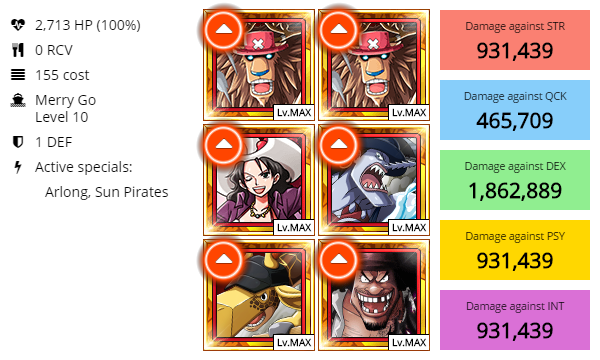 Real Nami: Despair Captain + Friend for 2 turns. That's quite the usual standard crew but let's be honest. 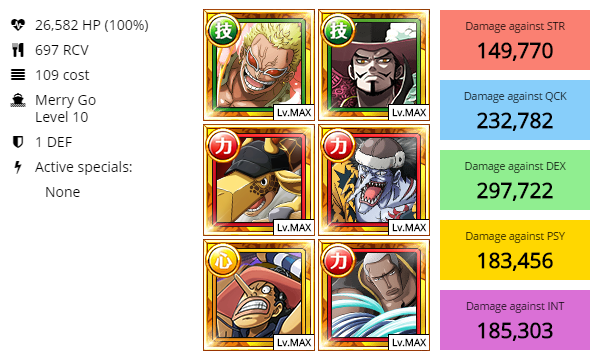 Mihawk will help alot at boss stage to damage all enemies by 30%. 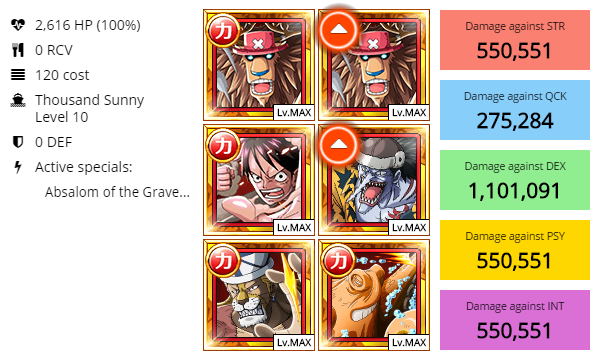 Coffin boat and 2x Mihawks recommened to finish faster. 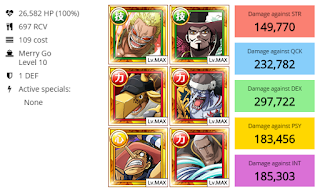 Use GP Usopp in stage 5 if needed. 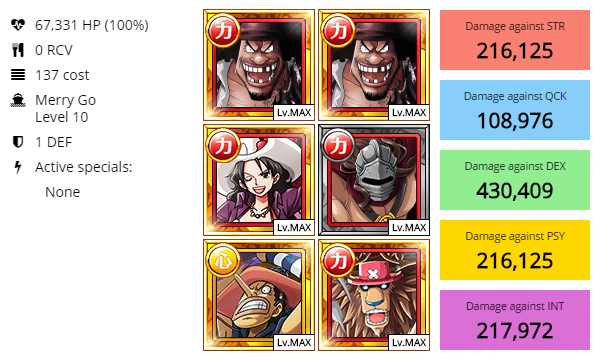 Otherwise you can go with Alvida / Perona for boss stage. Also focus the real Nami first. So you won't lose half of your HP. This crew has one aim. Defeat all Namis by losing HP from real nami's despair and release specials to one turn K.O. 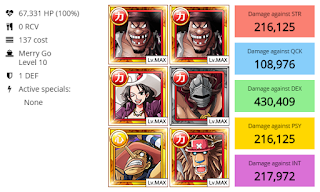 Alvida to block most damage and the STR Giant to block some damage on next turn. 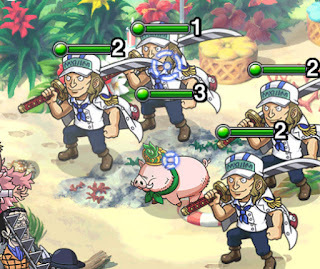 You should have at least 50k HP in total or this won't be easy at all because 6 namis hit hard and you need spare HP for despair. On this team you must go full in. Don't get hit and focus the real nami first or else you fall to 0 HP. 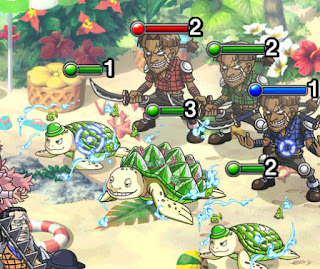 Win boss stage in 2 turns. STR Kaku is replaceable with the STR Knuckle Marine but your damage output will suffer. Alvida here is kinda some SOS character if you fail at stage 6 or however. I don't understand the arrows and their colours. 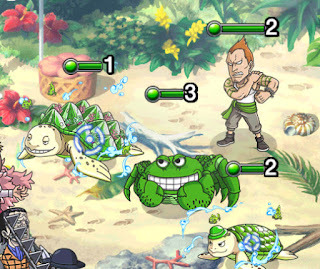 How do we know which Nami is the one that will despair our captains?